Say what you will about Quentin Tarantino’s cinematography and storytelling—there’s plenty to say—but you can’t deny the transportive quality of his films, that obsessive attention to the prevailing trends, fashion, and pop culture of a particular era that makes them distinctly his. 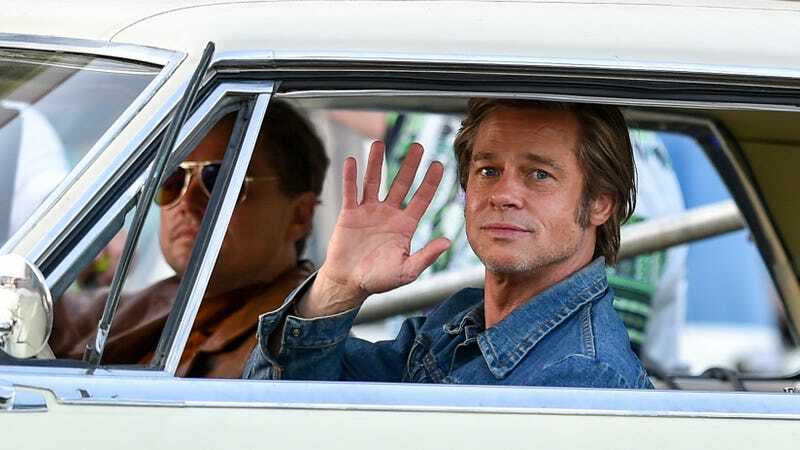 That continues, it appears, with his upcoming Once Upon A Time In Hollywood, which looks to luxuriate in its 1969 milieu in new photos shared by Vanity Fair. Yellow, unsurprisingly, is a good look on a comfortably sun-baked Brad Pitt in the above pic, which finds the actor’s Cliff Booth rocking a tight, sunny tee in a golf cart just a few shades darker. Booth, who here evokes the lazy charm of the L.A. stoner Pitt played in True Romance, is the stunt double and best pal of Leonardo DiCaprio’s Rick Dalton in the film. Dalton, a TV star trying to make it in film, gets to shine as both an action star—look at him leap, shotgun in hand!—and a variety show schlub in the photos, which paint a stark contrast between the two phases of the character’s career. In addition to the round glasses Al Pacino’s donning as Hollywood agent Marvin Shwarz, the photos also highlight Margot Robbie’s Sharon Tate. There’s a palpable melancholy to her shots, an angelic quality that can’t help but be informed by what we know about the actress’ fate at the hands of the Manson Family. Head to Variety for the full set, or see a smattering in the below tweets. DiCaprio, Pitt, and Robbie star in Once Upon A Time In Hollywood alongside Bruce Dern, Timothy Olyphant, Lena Dunham, Luke Perry, Dakota Fanning, Clifton Collins Jr, Tim Roth, Michael Madsen, Scoot McNairy, and many, many more. It opens on July 26.